At the beginning of the month I attended a workshop where off camera flash was a large part of the focus. When this topic was covered in the first workshop I attended, it was just too much for me to take in along with everything else I was trying to learn at the time But, when it was covered at the second workshop I was all ears! So much so, that I immediately walked out of the workshop and bought myself some new equipment and started experimenting with it. The thing about photography is that the learning is never ending. The second you master one technique there are ten more waiting in the wings for you to get started with. It's one of the things I love so much about it. I think most of us are that way. I can't think of a single photographer I know who doesn't turn into a complete geek the second you put a new piece of equipment or technology in their hands. For my March self-portrait, I wanted to see if I could put a twist on one of the amazing things that we learned how to do at the workshop, which was to photograph cigar smoke. I can't wait to try that one in a few weeks when I will have someone to pose for me and help me out. But cigar smoking and I are never gonna be BFFs, so I opted to play around with some glitter instead. 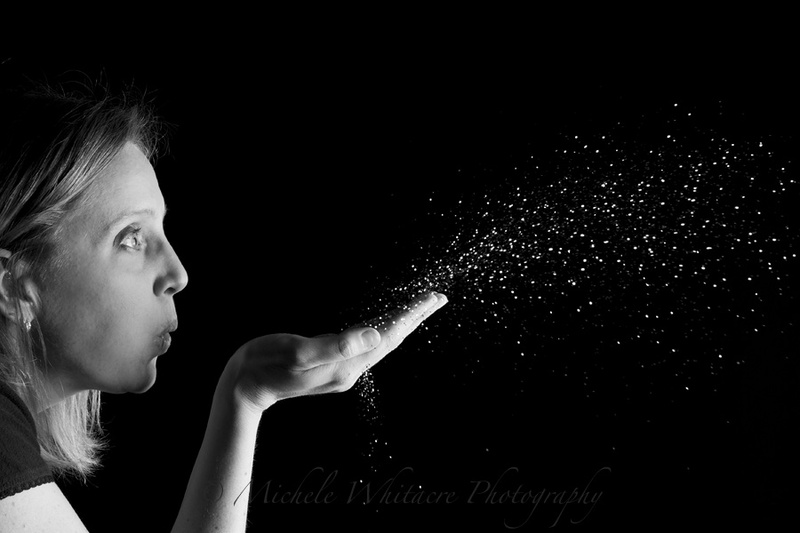 I have to admit that this is one my all time favorite self-portraits! My back yard is now completely covered in gold glitter, and the dogs are going to be dragging it into the house for weeks but it will be so worth it knowing that it helped me capture this fun photo. Equipment Doesn't Matter Or Does It?